Having a virus on your Android phone with all the stored information might be killing, see the best free antivirus for Android , and learn how to avoid virus attacks via this article. When compared to PCs, having free antivirus for Android is not so crucial like it’s on PC, but with the great evolution on the Android, which has led to having a great amount of data and information stored on your phone, it has been crucial today. Nowadays, you store your personal data, bank accounts, credit cards, browsing history, and more, which means your safety and privacy are related to losing your money, or even yourself. 2 Years ago, there were only 1% of Android phones were infected with viruses according to a report from Alcatel-Lucent. But, in another study, the researchers found that the number of times infected links are clicked on Android phone equal three times over the PC, which makes your phone so close to having a virus on it. If you were one of those with less luck, your phone might get infected with a virus, which will cause a huge number of problems that you can’t face alone, and for that, security companies like Kaspersky, Avast, and others have made their existence on Android and provided us with a great number of Android virus removal tools that will help you protect yourself and your phone from getting infected. In the following lines, I will show you the best free antivirus for Android according to Gihosoft’s team, and in the end, I will tell you the best tips you should follow to avoid Android virus attacks. Before starting, I have to mention that this list is not sorted according to the higher rank or lower rank, I will only show you the top 10 best free virus removal apps for Android and you can choose the best and suitable one for you according to what it offers as everyone may offer different features that the other doesn’t offer which make it harder to compare between them from only one man’s prospect. AVG and Avast, two big names in PCs’ antivirus software’s, they’ve come to Android after a long time of being only on PC, and due to 2016’s purchase, I will talk about AVG and Avast at the same paragraph as they almost have the same experience. 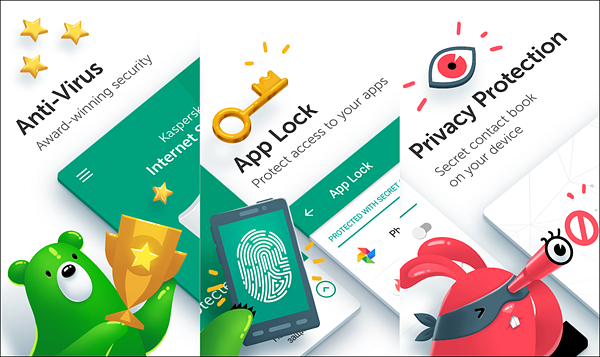 Both AVG and Avast offers battery, memory, and phone boosting along with the main features like scanning apps, games, cleaning unnecessary data, Anti-theft features like locking and locating your stolen phone and making your phone play a siren sound. AVG also offers a feature called Theftie which allows your mobile to send an email of anyone trying to unlock your phone to a pre-defined email address. Moreover, this free anti-virus app offers a Surveillance Agent which allows you to remotely capture photos and record audio from your phone via AVG website. 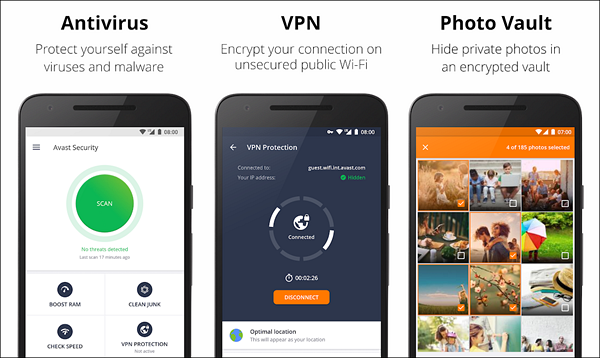 On the other hand, Avast offers a Photo Vault to protect your photos and media with a PIN code, and a Call Blocker feature that blocks specific pre-added phone numbers. 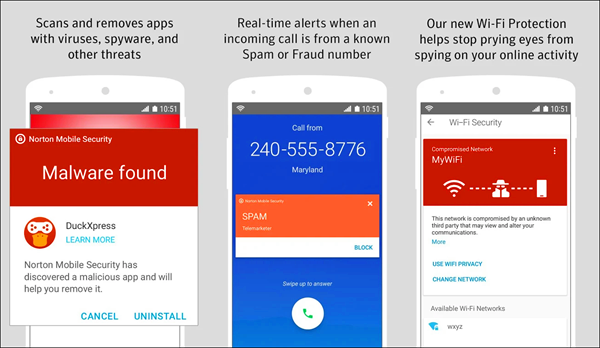 AVG Antivirus and Avast Mobile Security are both free virus removal apps for Android and available to download via the Play Store, along with premium versions with the price of $2.99 per month. Although its reputation like its fellow of being a slowing software on PC, Norton has a great reputation on Android. 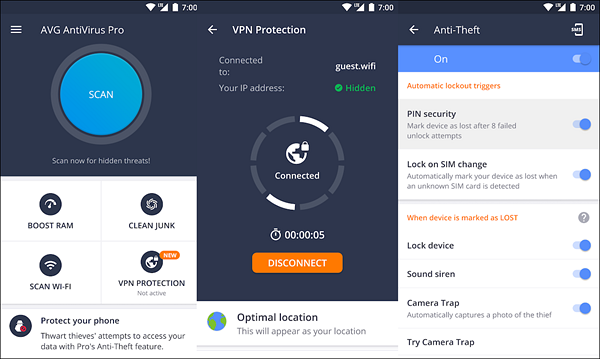 It offers all the basic features of an free antivirus for Android would provide like scanning and removing apps and malware, Wi-Fi scanning, Call blocking, Phone protection that allows you to track your device location and saves the last location when the battery level was critical. This free security app also has the feature of capturing anyone trying to unlock your phone. These all features are all available on the free version of Norton Security and Antivirus, the premium version offers some more features like web protection and ransomware protection, along with real-time alerts when receiving a call from a spam of fraud number based on FCC and FTC blacklist (US only). Norton Security and Antivirus also gives you advice when installing an application on Android to tell you whether this app and its permission are safe to use or not. You can download this virus removal app on Android via Google Play Store for free and enjoy the free features, or get all the premium features as a 30-day trial and then purchase it with $39.99 per year to enjoy them all. Clean Master was one of the pioneers of the service providing an application on Android phones, along with what it does in removing Junk files and boosting your phone, it also provides you with some great Antivirus features. It scans for virus on all apps, blocks and removes virus, and also offers you a photo vault to protect your photos and videos with PIN or passcode. 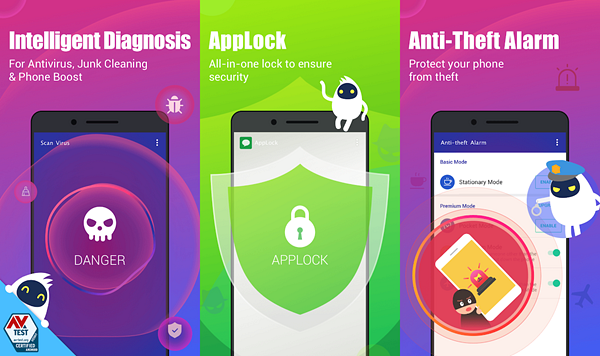 Clean Master also detects fake WiFi and unauthorized connections, and this virus removal app has a great feature for more security also which is AppLock that allows you to hide your app and keep it safe with an AppLock PIN or pattern. On the other hand, Cheetah Mobile also launched Security Master, a child of Clean Master but more specialized on protection and security. Security Master provides you with Antivirus function to keep your phone and privacy safe from virus & malware, SafeConnect VPN to bypass firewalls and access sensitive websites or watch videos not available on your country using virtual location which also protects your online activities. It also offers a Message Security function that hides notifications timely to protect your privacy and gather all your chat notifications together to make it easier to be read and managed. Also, it offers a function called Intruder Selfie that takes a photo of intruders who are trying to unlock your mobile phone. 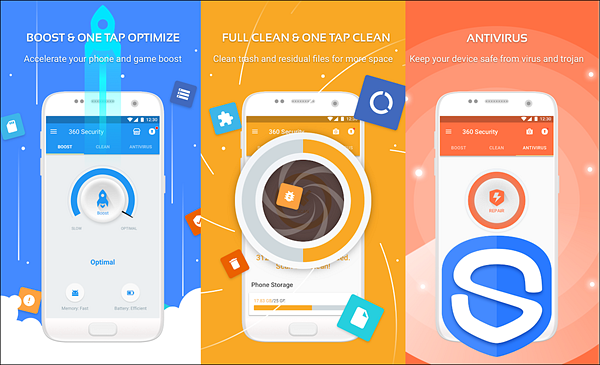 Both Clean Master and Security Master are great Android virus removal tools available for free through the Google Play Store and offer in-app purchase themes and others that you may not need. Along with its reputation for being one of the strongest Antivirus software on PC, Kaspersky Mobile Antivirus has proven its strength in the field over the Android phones. Kaspersky has both a free and a premium version, both offers SMS, call blocking, virus scan, and anti-theft features. In case you have purchased the premium version of the anti-virus app or what’s called the Pro version, you will get a real-time protection along with an AppLocker and a links scanner to avoid opening infected websites. Both versions are available on Google Play Store, and you can get your Pro version of Kaspersky Mobile Antivirus for $14.95 per year. 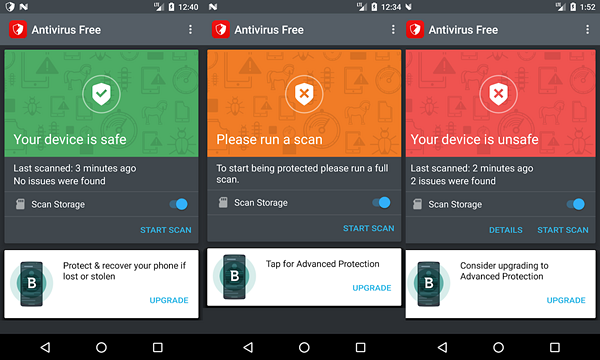 Bitdefender is one of the best virus cleaner apps for Android, as it only offers the basic features of an anti-virus app with a simple UI and a smooth performance that makes it the best choice for low-end mobile phones. It does all the scan stuff and nothing more so it doesn’t negatively effect on your battery or performance and doesn’t require paying some dollars to get more features. Bitdefender Antivirus is totally free with no app in-app purchases, but all it has is some ads to get money for developing the application. If you searched a little in the Antivirus market, you will find a big name with pure reputation called McAfee, let’s welcome it over Android. McAfee Mobile Security and Antivirus simply offers all the required features of a security and a data protection application. It provides you with the basic scanning features, along with features like anti-theft, anti-spyware, security locking, and capturing the thieves of your phone. It also records the latest known locations before the phone shuts down, and above all of that, this Android virus removal tool has its boost features to be one of the best competitors to the Clean Master and the others. 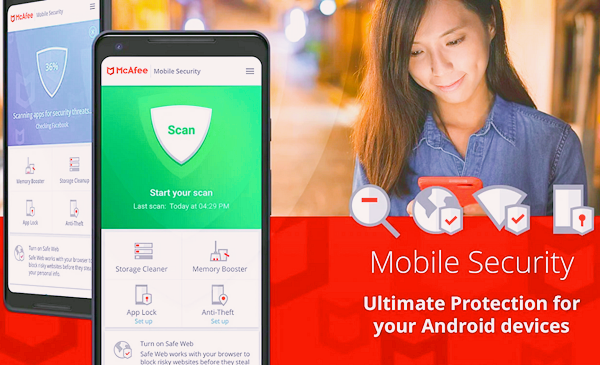 You can download McAfee Mobile Security and Antivirus for free with a limited number of features over Google Play Store, or purchase it for $29.99 per year to get them all. 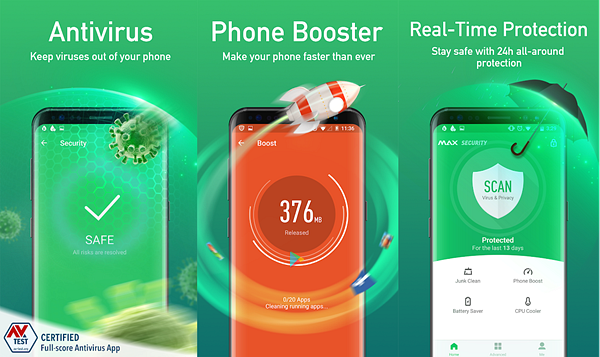 With a rate of 4.8 out of 5, Virus Cleaner – Max Security is considered to be one of the best virus cleaner apps for Android on the Google Play Store. Max Security offers you a huge number of features that includes basic and advanced protection features. It provides you with a real-time protection, virus scanner and cleaner, AppLocker for your applications, a booster for your phone and RAM with one tap, CPU Cooler to optimize your CPU usage, and a battery saver. All these features are available on Google Play Store, some are for free, and the others are available as in-app purchases. Another application that’s similar to Clean Master even in interface and colours. 360 Security provides you with a virus scanning, junk files cleaning, speed boosting, call & SMS filtering, notification management, Wi-Fi security, and Intruder Selfie features. 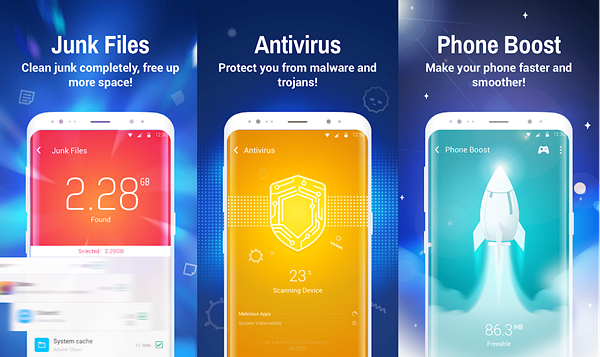 This best antivirus for Android also offers a real-time protection with the ability to scan installed apps & local saved APKs, with a payment and shopping security. More importantly, it provides you with a fingerprint lock that unlocks screen quickly and easily with your fingerprint using your phone’s fingerprint sensor. You can download 360 Security – Free Antivirus from Google Play Store, and it has some in-app purchases. 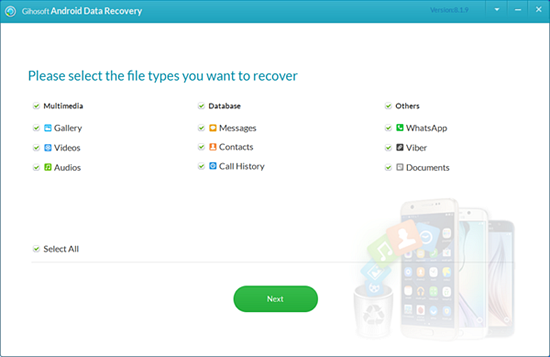 If you are looking for the best antivirus for Android because you have been infected and lost your files, I recommend you to try our free Android Data Recovery software which will allow you to recover all your lost data from Android within clicks. Be aware of your clicks on your Android phone, and don’t click on any link provided through the email or any other platform as it might be infected and may cause many problems for your device.